"Jim Clark Team Lotus langarm Shirt"
Dieses langarm Shirt ist das perfekte Accessoire für jeden Jim Clark und Lotus Fan. Jim Clark Team Lotus World Champion 1963 langarm Shirt in grün von Star Designer Nicolas Hunziker mit der Abbildung des Lotus F1 Monopost mit dem Fahrer Jim Clark. Jim Clark, was a British Formula One driver from Scotland, who won two World Championships, in 1963 and 1965. 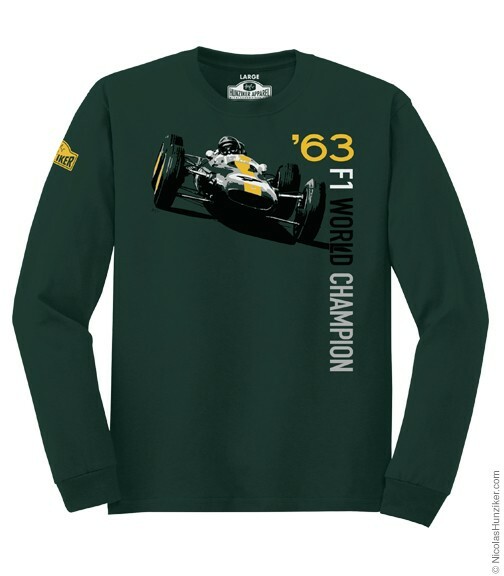 This green longsleeve shirt is designed from Nicolas Hunziker with a print from the lotus f1 monopost and the driver Jim Clark. Weiterführende Links zu "Jim Clark Team Lotus langarm Shirt"